When I received my September Tasting Box from Foodzie and discovered that these cashews were part of the Tea Time Treats themed box, I was elated! I found these on Foodzie some time ago, and have wanted to try them ever since, but was a little afraid. Even though I consider myself to have somewhat of an adventurous palate, I don’t like the idea of spending money on shipping an item to me only to regret it because I didn’t enjoy what I purchased. That’s one of the reasons I love Foodzie’s Tasting Box … it enables me to try things that might otherwise not have. And I’m really glad I got to try these because they’re really quite delicious. Before opening the package, I had read one less-than-satisfied Foodzie customer’s remarks on Foodzie’s Facebook page, complaining about the greasiness of these nuts. And yes, they are on the oily side (have a napkin close by when you snack on these!) as they are processed with not only olive oil but ghee – and nuts have their own natural oil as well. But I’m not finding to be too oily, but perhaps that’s because I like the way every flavor (including that of the oil and ghee) comes together on the palate. Or maybe it’s because I always order my popcorn with extra butter. The cumin, the ajwain (which has woody, resinous sort of flavor that is somewhat reminiscent of rosemary with cedar-ish top notes), the salt, and the sweet nutty flavor of the cashew combined with the olive oil and ghee make for an explosion of contrasting flavors. It is very savory, but with hints of sweetness in the background. A little smoky. Warm with spice. Salty. And irresistibly crunchy. YUM! And when it comes to tea time – these are a delightful snack. I don’t know that I would serve them at a tea party because as I sad, these are somewhat greasy and you don’t want guests wiping their fingertips on their tea party dress. But, they’re excellent now, as I sit here on my own, just contemplating the joy of my tea and these cashews. The tea I chose to enjoy with these cashews is this Wuyi Oolong from the Tao of Tea. I like the way the smoky tones from the tea and the smoky notes from the cumin enhance each other without one overpowering the other. 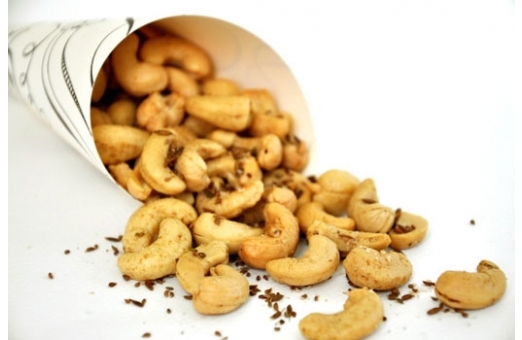 These cashews are deliciously different. I really like them, and trying them makes me curious to try Oren’s Kitchen’s other offerings … Coconut Chili Macadamia Nuts? Those are a definite must try!